In this course, educators will explore how educational research has shown that compared to traditional teacher-centered instruction, certain learner-centered methods lead to improved learning outcomes, greater development of critical high-level skills, and increased retention in science, technology, engineering, and mathematics (STEM) disciplines. While the text centers from that of the college teaching perspective, educators of all grades can glean and learn big takeaways from this text. 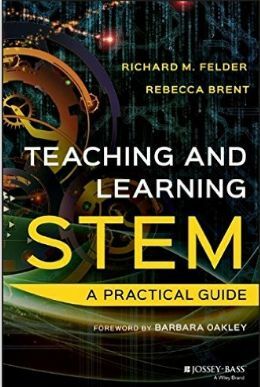 Teaching and Learning STEM​ presents a trove of practical research-based strategies for designing and teaching courses and assessing students' learning. The text draws on the extensive backgrounds and decades of experience in STEM education and faculty development. Its engaging and well-illustrated descriptions will equip educators to implement the strategies in the classroom and to deal effectively with problems (including student resistance) that might occur in the implementation. Educators will explore how to plan and conduct class sessions in which students are actively engaged, irrespective of class size. They will learn how to make good use of technology in face-to-face, online, and hybrid courses and flipped classrooms. Teachers will exami​ne how ​to assess how well students are acquiring the knowledge, skills, and conceptual understanding the course is designed to teach. Educators will be presented with ways of​ ​helping students develop expert problem-solving skills and skills in communication, creative thinking, critical thinking, high-performance teamwork, and self-directed learning. Teachers will have the skills and knowledge to use the course content as a core framework for ​meet the learning needs of STEM students with a broad diversity of attributes and backgrounds.